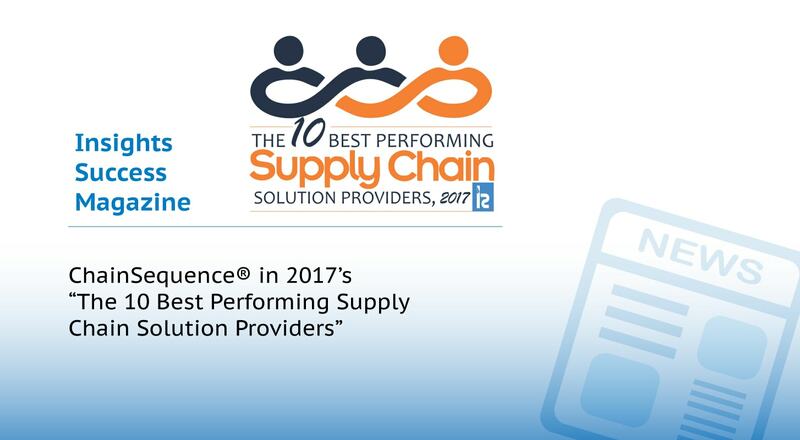 ChainSequence Awarded “10 Best Supply Chain Solution Providers” - ChainSequence, Inc.
Supply Chain and Sales & Operations Planning (S&OP) consultant ChainSequence®, Inc. was awarded the “ 10 Best Performing Supply Chain Solution Providers 2017” designation by Insights Success magazine, a business resource focusing on innovations in emerging business solutions for executive professionals, investors, and consultants in many various industry sectors. In selecting ChainSequence, the publication’s editorial team noted the firm’s continuous success in remaining true to its education-centric, core service model while consistently accounting for new market realities and incorporating advanced tools to help clients better respond to fluctuating market drivers. Insights Success also indicated that ChainSequence is on a steady growth track, increasing its customer base overseas and realizing increased client demand for its services in the consumer products, retail, and service-oriented industry sectors. Headquartered in Chicago, Global Supply Chain expert ChainSequence® Inc. offers a fresh perspective toward re-engineering outdated supply chain methodologies and resolving persistent challenges in S&OP planning, to measurably improve the integration of supply chain processes with Sales and Operations goals. ChainSequence’s twenty-plus years of experience focuses on leading full life-cycle initiatives from planning and designing to implementing more advanced business processes, based on each client’s custom needs. ChainSequence’s progressive, knowledge-share approach is designed to give businesses the forward-thinking tools and training to better compete and effectively respond to ever-shifting supply chain requirements, increased client demand, and fluctuating market changes. For more information, please visit http://www.ChainSequence.com.